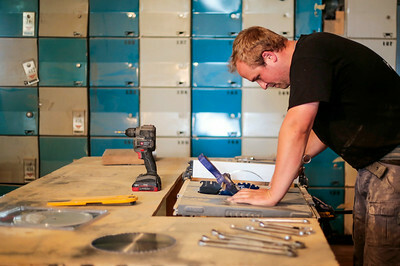 Kyle Grillot - kgrillot@shawmedia.com Reclaimed furniture store owner Brent Hollenberg works on an end table inside their new Crystal Lake location Monday, June 30, 2014. Hollenberg has been using social media to build his store's brand using networks like Facebook, Pinterest, and Instagram. "It's kind of like owning a Lamborghini," said Hollenberg. " If you only drive it once a year, no one will know you have it. You need to be somewhat active with posting so people know you are there." Kyle Grillot - kgrillot@shawmedia.com Reclaimed furniture store owner Brent Hollenberg (left) works with Doug Snelten of Crystal Lake inside their new Crystal Lake location Monday, June 30, 2014. Hollenberg has been using social media to build his store's brand using networks like Facebook, Pinterest, and Instagram. "It's kind of like owning a Lamborghini," said Hollenberg. " If you only drive it once a year, no one will know you have it. You need to be somewhat active with posting, or people won't know you have it." 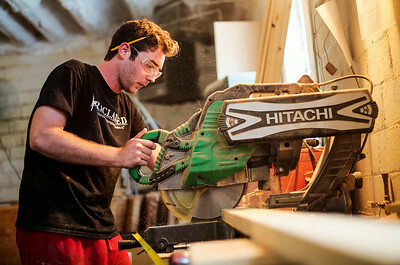 Kyle Grillot - kgrillot@shawmedia.com Reclaimed furniture store employee Doug Snelten of Crystal Lake works inside their new Crystal Lake location Monday, June 30, 2014. Reclaimed furniture has been using social media to build his store's brand using networks like Facebook, Pinterest, and Instagram. "It's kind of like owning a Lamborghini," said Hollenberg. " If you only drive it once a year, no one will know you have it. You need to be somewhat active with posting so people know you are there." Kyle Grillot - kgrillot@shawmedia.com Large signage on the new storefront in Crystal Lake. 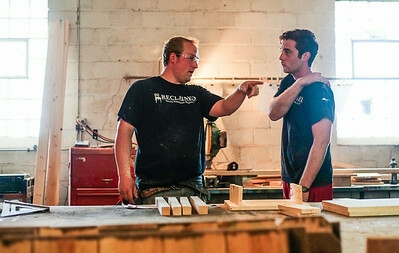 Reclaimed furniture store owner Brent Hollenberg (left) works with Doug Snelten of Crystal Lake inside their new Crystal Lake location Monday, June 30, 2014. Hollenberg has been using social media to build his store's brand using networks like Facebook, Pinterest, and Instagram. "It's kind of like owning a Lamborghini," said Hollenberg. " If you only drive it once a year, no one will know you have it. 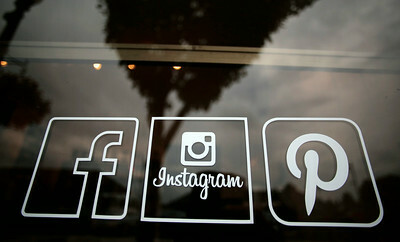 You need to be somewhat active with posting, or people won't know you have it."